Measuring events through palmistry is not exactly easy to do. However, the timing on life line is an important part of interpreting the markings. Knowing whether an event has passed or is yet to come can prevent much unnecessary worry; some markings on this line are negative indicators. The methods used by palmists are not exact, but the following timing on life line example is relatively close. The beginning of the line starts at the top, and many hand readers agree that is where to begin the timing. I have observed that when estimating timing on the life line, approximately halfway along shows the age of forty. 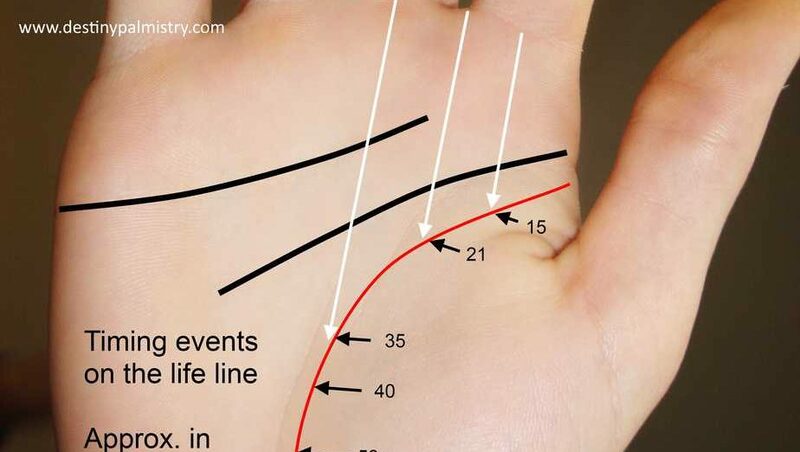 A straight line drawn from the centre of the index finger to the life line is around the age of fifteen. A line straight down from the gap between the index and middle finger is the approximate age of twenty-one. From the centre of the middle finger, the age of thirty-five. 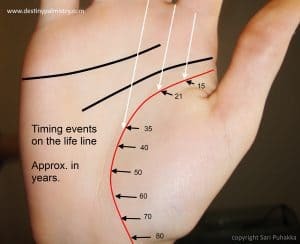 If a line is broken, has a broad curve, is close to the thumb or reaches out towards the moon, it can be difficult to estimate timing. As a rule, to simplify it all, the first quarter length from the beginning of the line represents the age 1-20. The second quarter is 20-40, the third 40-60 and the last 60-80. The methods used by palmists are not exact, but the following example is relatively close, give or take a few years. Previous PostPrevious Mars Line Meaning on Palm is Awesome. Next PostNext Life Mission is it Important to Have One?